Wise Blood’s frontman, Chris Laufman, is losing it. His just-launched rabbit hole/website, designed in collaboration with artist Borna Sammak, is full of weird messages and new work. An angular yin-yang shape cuts through the landing page, framing a video of Laufman talk-singing alone, backed by a new pan-flute and chant incantation. Click through deeper for Laufman's life story—he's been in three bands and interviewed on television once (about feral cats). To find "Spliff," a new demo, enter the site's blog and then "click here" on entry four. Drag around the shredded clip art, there's a glittering, clickable "Spliff" MP3 hiding there, underneath. Its broken guitars and occasional screams are rich, foul and satisfying. To approach it by manically rummaging is appropriate. It's an anxious song that feels like a bad and a good omen. We found some other weird stuff in the pile too (no spoilers). A full-baked Wise Blood project is expected early next year. 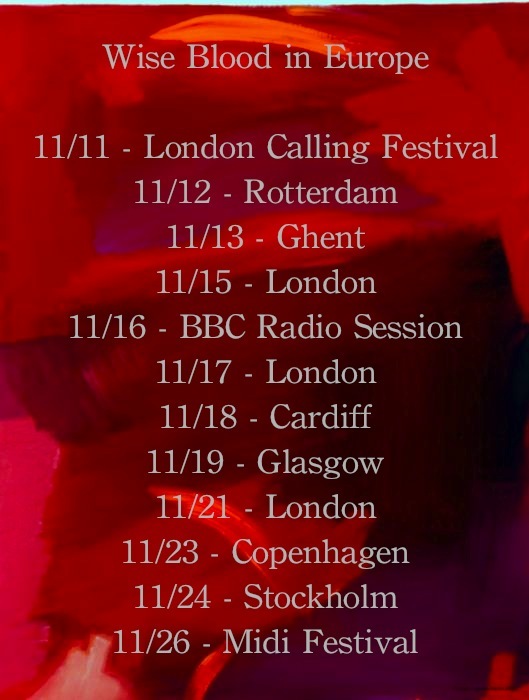 For now, Laufman is on tour with Wise Blood in Europe through Thanksgiving. See dates here.